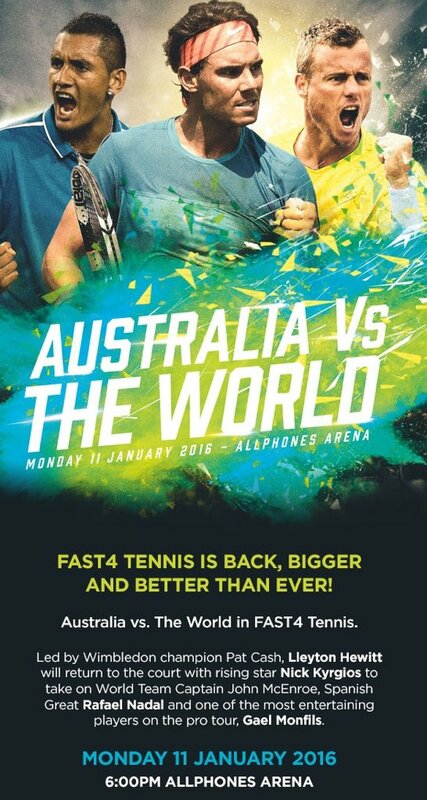 Rafa Nadal will headline Fast4 exhibition in Sydney, Australia in January! SYDNEY, Nov 12 — World number five Rafael Nadal will headline a Fast4 exhibition in Sydney in January, joining Gael Monfils and Australian stars Lleyton Hewitt and Nick Kyrgios in the short-form format, Tennis Australia said today. The expanded event, which follows last year's launch featuring Hewitt and Roger Federer, has an experimental format with sets won by the first player to four games, no deuces and play continuing after lets on serve. "It's easy for the crowd to get involved in every point which makes for a great atmosphere," 14-time Grand Slam champion Nadal said. The format has been piloted at clubs across Australia and is being billed as the tennis equivalent of Twenty20, the short form of cricket which has proved a commercial hit. Nadal, Monfils and seven-time Grand Slam winner John McEnroe will form a world team while Hewitt, rising star Kyrgios and Pat Cash will represent Australia in the event in Sydney on January 11.